Last night, me and beloved went to Tokyo Cafe. We have always wanted to go here ever since its incarnation when The Block opened. But when we see the price tag on their posters outside, we get turned off and eat elsewhere. However, the posters look extremely appetizing, and finally, we got our chance to taste them. The first problem I had with the cafe are their choices. Aside from their pastas, since I’m not much of a pasta eater, I practically want to try out every item on their menu. Even their pastas look appetizing. I was torn between ordering a pizza or their burger, but I finally decided to order their Hamburg and Shrimp plate (268 Php). Beloved also had a hard time choosing, and she settled for their Fish Burger (180 Php). We decide to share our orders, since we want to try them out. Our drinks were an iced coffee called Tokyo Ice (84 Php) for beloved and Vanilla Milk (125 Php) which is basically vanilla milkshake for me. 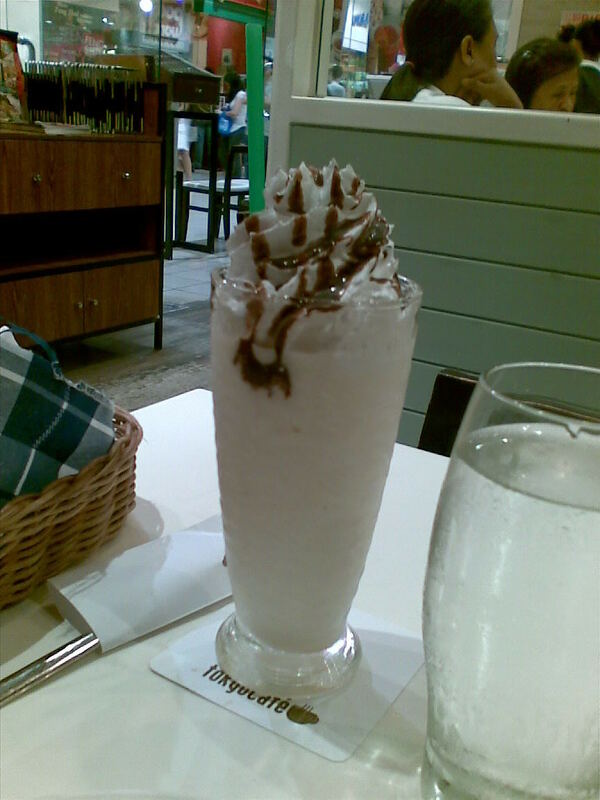 We also ordered their Azuki Parfait (118 Php) to follow. Our drinks came first. The milkshake was, well, normal. It wasn’t bad, and it’s quite good. But it’s nothing exceptional from other milkshakes I have tasted. 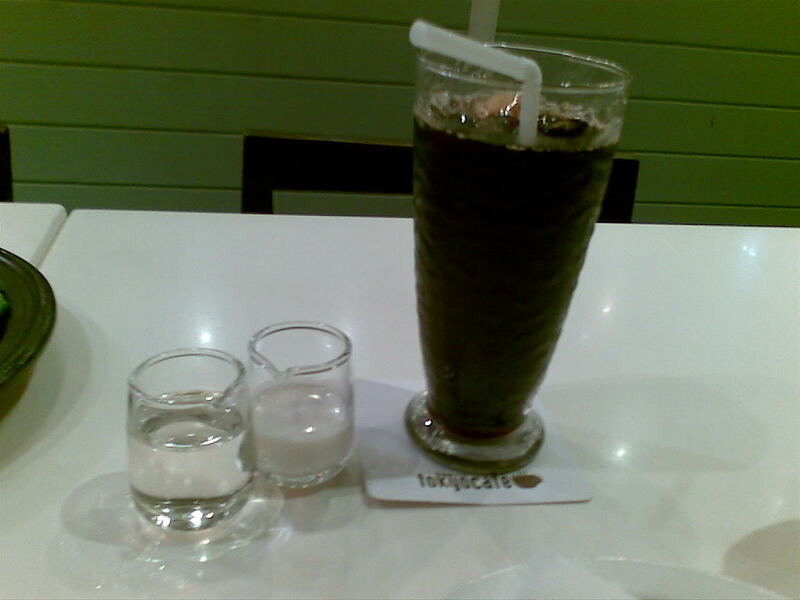 Heck, I find shakes from Zagu or Quickly, or even the one from where beloved brought me near UST on par. But the serving was pretty big, although for the price, I would’ve wish it a bit bigger. The Tokyo Ice was bitter. Extremely bitter. The first sip was like swallowing a coffee bean raw. Of course, they provided milk and syrup for the customer to taste. I find it difficult anyone liking this as-is, except perhaps those who like their coffee black. 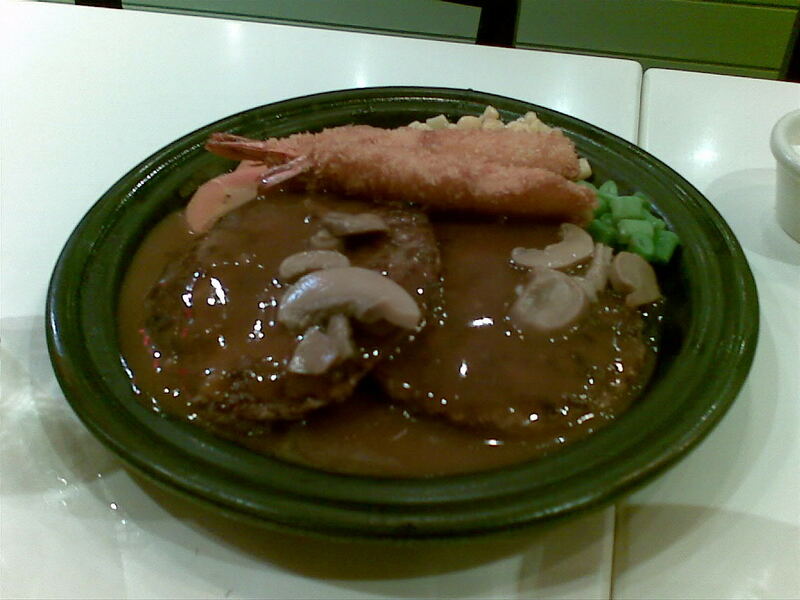 Next came was the Hamburg and Shrimp. 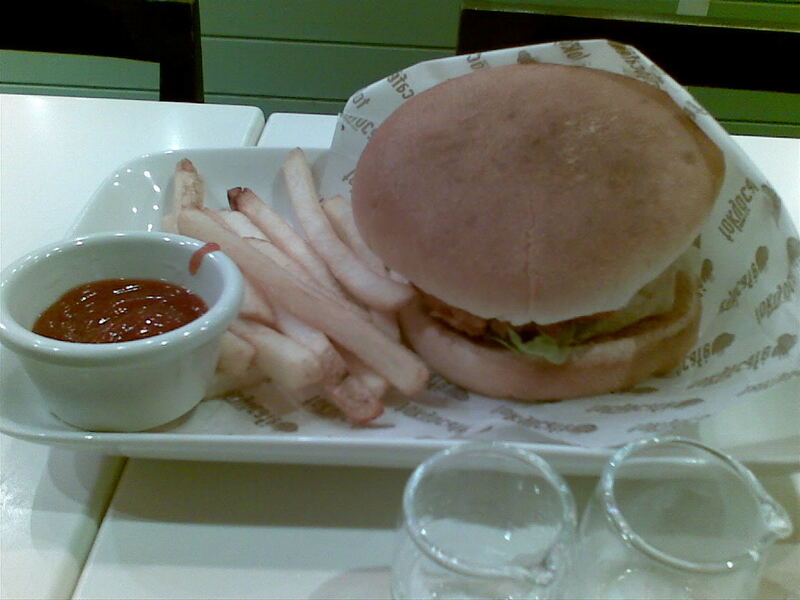 The burgers were decently sized, although a bit small for the price, as well as their shrimps. Note that their shrimp was cooked Ebi-fry style, not tempura. It had a pretty thick crunchy breadcrumb batter. The shrimp was almost nonexistent in mass, but it’s there in taste. It came with a garlic-mayo dip which was a pretty good complement. The hamburgs were extremely juicy. However, I found it a bit plain. Without the mushroom gravy sauce, it probably would’ve tasted on the bland side. The Fish Burger had huge buns, and a quite generous portion of fish in it. The fries were a bit on the flimsy side, but they were bigger than your average fries, although a tad fewer in quantity. The ketchup that came with it was extremely sweet. The burger had a sauce that somehow normalizes the flavor. There’s the fish taste, and there’s the sauce. What’s weird is that the sauce wasn’t sweet, sour, spicy, salty, or bitter. Perhaps the best way to describe it is mild. Finally, the parfait. It was also a pretty small serving for its price. However, it was the best order that came. 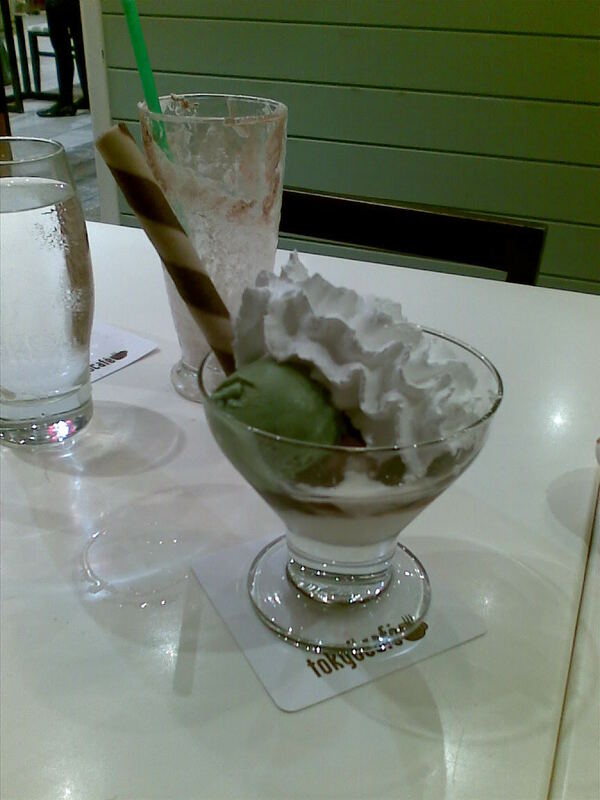 The red beans were sweet, a great complement to the leafy tea taste of the green tea ice cream. The vanilla was also there to normalize everything. And everything was swimming in a pool of vanilla, perfect for green tea and vanilla lovers like me. So, how do I conclude this? I want to try out other stuff on their menu, especially their pizzas. However, I find everything to be a tad overpriced for their servings. Aside from the dessert, nothing was exceptional. I can compare what I’ve tried from their menu to somewhere else cheaper and on par or even better. Unless you really, really want to try this out, you’re not missing out on anything. Not recommended for: Impoverished starving denizens. Smart nomnomnom tip: Don’t forget to wash everything down with water afterward—it’s the only thing cheap in this store.